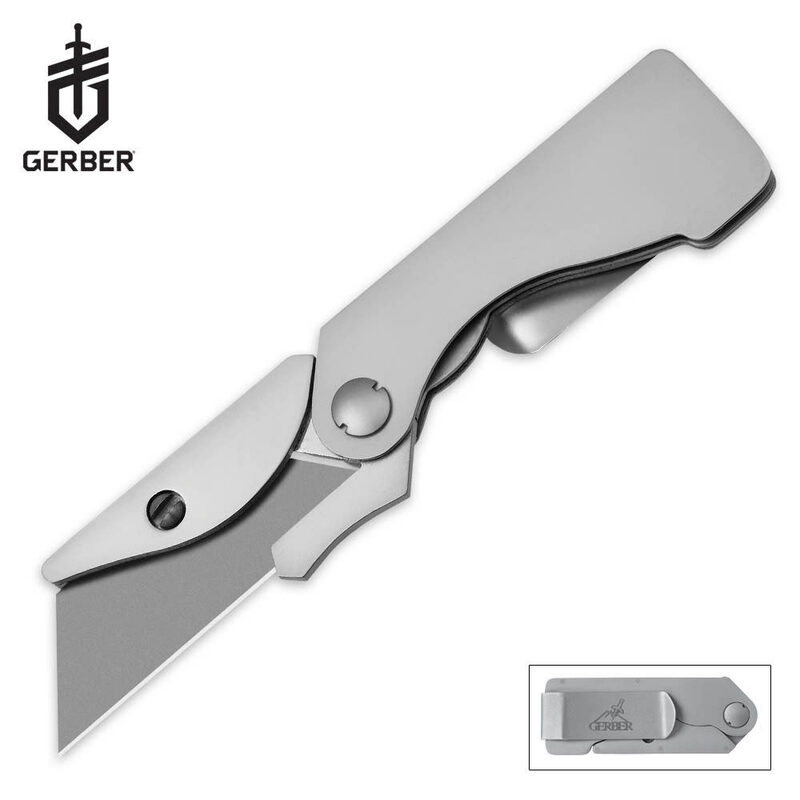 Gerber EAB Pocket Utility Knife | BUDK.com - Knives & Swords At The Lowest Prices! 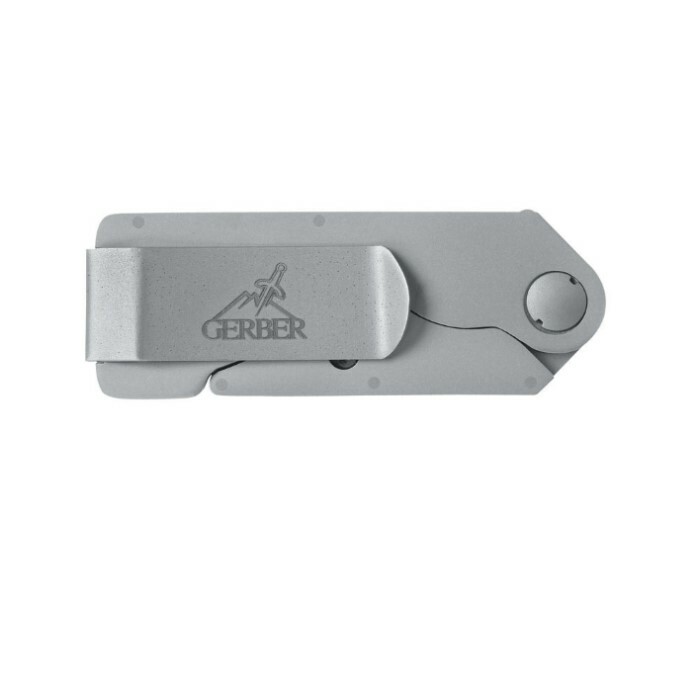 The Gerber Exchange-A-Blade pocket knife uses contractor grade or standard size utility blades that can be easily replaced as necessary. The stainless steel handle works well as both a pocket or a money clip, and liner lock construction keeps the blade safe. I received this knife yesterday and I am very impressed with it. The build quality and design are excellent; it opens and closes smoothly with a nice positive lock when open, and fits very comfortably in the hand. It is lightweight but still heavy enough to feel solid and durable. The size is great as well, I don't think they could have made it any smaller. This is easily a 5-star product. great little razor knife. got mine and first day had it on my belt at work, the blade open just a little, had I stab my arm. don't know how it open. great knife just be aware that it could open. I need to get one of this specials EAB Pocket knife for my daughter, who like me ,:" Will wear it around her neck w/ a sharp looking neck chain, I've had mine already for about four years and had to produce it once, which immediately scared off the perpetrator, I just simply opened it from my neck(Neck chain) and His eyes got BIG...So for my daughters Protection, I've already ordered five of these 'Suckers' . Man , I wished they had these back in the Vietnam War, It would have been a standard issue ITEM( RLTW). This is the ultimate defensive weapon. First off, it's legal to carry just about everywhere because foremost it is a tool. It comes in handy a lot too. It can be deployed single handedly with practice. This is a great way to ground the loose cash in your pocket too. If i travel to a dangerous area, i know that in one motion i can pull my tiny blade and throw a few bills on the ground while stepping back and giving an armed crook an option. Loose bills or several hundred stitches. That's an easy life-choice. Everyone knows what a knife looks like, but moreover everyone knows what a razor blade feels like just by looking at it. The precision, efficiency, and indiscriminate glide of a razor blade laceration is enough to make anyone cringe. Sturdy, clean, easy to use, simple yet intimidating. I recommend buying some quality blades from a hardware store. I find myself wondering why there are not more reviews on this razor knife. It's great. Let me break it down...it can be used as an everyday utility knife and it works great for that, It can also be used under the right circumstances for self defense, ie your attacker does not have a superior weapon such as a gun. It is stealth, light wieght, legal in most places aside from airports. The clip is very very strong. The blade locks open securely and then there is the fact that the blade is a razor, one that can be replaced easily when it needs to be. It doesn't get any better than a razor's edge. It looks as though it may not be comfortable in a grip but that is not true. This simpe knife had some thought put into its design. Its great. This lil gadget is great primarily for a "good concealment with big potential" situation. Kind of like this, where i work we're not allowed to use our own knives, so they supply us with these crappy "safety knives"... so i pretend this is my money clip at work and just use it when the boss man aint around.